We unveil a new poll tracking model for Virginia (and beyond). A controversial study on the death toll of the Iraq War gets an update. And we add a little detail on how partisanship colors perceptions of the debt ceiling. This is HuffPollster for Friday, October 18, 2013. NEW POLLSTER VIRGINIA POLL TRACKING MODEL - Starting Friday, the Pollster chart on the 2013 Virginia governor's race incorporates a more sophisticated model to estimate trends in support for each candidate. We will apply a similar model to the chart for the New Jersey Governor's race early next week and, eventually, to most or all of our polling charts. Previously, our charts used something called loess regression analysis to reduce the variability inherent in individual polls. The new technique, developed by Stanford University Professor Simon Jackman, builds on the model that we used to track the 2012 presidential election, which combined national and statewide data to estimate the standing in each battleground state. The Virginia model we unveil differs mostly in that it draws only on polling data from the Virginia race. The new HuffPost poll tracking model has several advantages over our classic approach: It deals with the fact that different polls have different sample sizes, and so not all polls contribute equally to the model's estimates. The model also helps correct for "house effects," the tendency for some survey houses to produce estimates that are systematically higher or lower for one candidate than other pollsters. Our correction pulls results toward the "industry average" for all pollsters (not polls) in Virginia. If a single pollster does a lot of polling and shows a consistent house effect, our model will reduce the impact of those polls on the overall estimate. Perhaps most important, by running a series of simulations (known commonly as the Monte Carlo method), the model allows us to quantify the uncertainty associated with the current polling snapshot. As Jackman has explained previously, that uncertainty comes from multiple sources: (1) sampling error in the polls themselves; (2) uncertainty about the house effect corrections; (3) uncertainty about how quickly vote intentions are changing. We represent the uncertainty in the chart through color bands around each trend line showing the potential variation in each estimate. For example, the chart currently shows McAuliffe leading Cuccinelli, 44.6 to 37.3 percent. The model tells us that there is a 95 percent probability that the current polling snapshot falls between 41.5 and 48. percent for McAuliffe and between 34.4 and 40.3 percent for Cuccinelli. Accordingly, because these confidence bands do not overlap, we are extremely confident that McAuliffe is currently leading Cucinelli. Misperception or motivated reasoning? - An additional tabulation sheds some light on how confusion and partisanship combine to create these results. Among Democrats and independents, respondents with a college education were more likely to choose the correct response, that raising the debt ceiling would allow the U.S. to pay more interest on debts. Among Republicans, however, the pattern was different. Those with a college education were more likely to say that raising the debt ceiling would directly increase government spending (67 percent) than those with a high school education (43 percent). 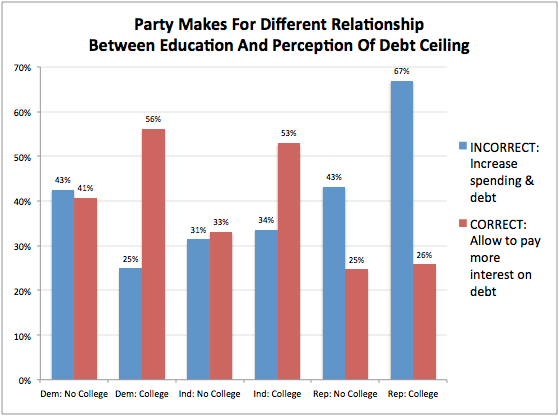 "The fact that misperceptions about the debt ceiling are more prevalent among college-educated Republicans," says political scientist Brendan Nyhan, "is disturbing but it should not be surprising." Nyhan, who specializes in the study of political misperception, notes via email that past studies have shown an inconsistent relationship between education or political knowledge and misperceptions. "The problem is that people who are more knowledgeable are also better able to seek out, accept, recall, and defend ideologically congenial beliefs even when those claims are not supported by the available evidence."